A Chinese man says violence that broke out at a Beijing Apple Store on Saturday resulted from a scalper cutting into a line of customers waiting to buy the iPad 2. Thirty-year-old Wang Ming says the bloody altercation at the store in Bejing's Sanlitun commercial district was between a "foreign" Apple employee and a Chinese customer. 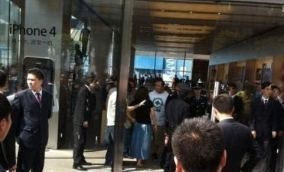 Wang, who said he was passing by when a bottle hit his head, heard the queue-jumping customer was a scalper. The New York Daily News reports that the "foreign" employee from the Beijing store allegedly pushed several people accused of cutting in line, which sparked a melee. Although many details remain unclear, photos from the scene clearly show that whatever happened resulted in a shattered glass door and several customers being injured. Long lines and pushy scalpers aren't anything new for iPad 2 fans in China. Demand for the new device is extremely high. The iPad 2 became available for sale in the country on Friday. Massive lines appeared outside Apple stores in Beijing and Shanghai. One store was out of stock within four hours of opening. CNET reports shipping estimates for the iPad 2 jumped from "one to two weeks" to "No Supply" on Apple's Chinese Online Store on Friday. The launch also drew dozens of scalpers who camped out with their families to hoard devices according to Chinese News site Xinhua. The site says scalpers offered to sell their iPad 2s to people waiting in line on launch day for 300 yuan (about $50) more than retail price. Scalpers are likely basing their business model on the initial iPad's success in China. When it launched, hundreds of consumers waited in line up to 60 hours to secure a tablet. That popularity translates into market share. Apple owns 78 percent of the tablet market in China despite having a limited reach (four retail stores) in the country and releasing the first version of the iPad in China as recently as September. For comparison, Apple has 82 percent of the tablet market in the U.S. after being released in April 2010 at hundreds of stateside Apple Stores. The iPad 2 is so popular in China, some stores are having trouble keeping even fake ones in stock. Paper replicas of Apple's latest tablet are flying off the shelves of some Chinese stores, according to Reuters. The younger generation of Chinese is purchasing paper iPads to use for gifts. According to an LA Times blog, the paper fakes are being purchased for the Qingming festival, an annual tradition where families burn paper replicas of things for their dead relatives to use in the afterlife.